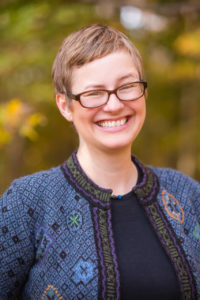 Alice L. Pawley is an Associate Professor in the School of Engineering Education and an affiliate faculty member in the Gender, Women’s and Sexuality Studies Program and the Division of Environmental and Ecological Engineering at Purdue University. Prof. Pawley’s goal through her work at Purdue is to help people, including the engineering education profession, develop a vision of engineering education as more inclusive, engaged, and socially just. To do this, she believes in saying what needs to be said – to colleagues, students, and the profession as a whole. She sees community as her religion in how she mentors graduate students, engages with colleagues in her local department, seeks collaborations with colleagues across disciplines and across the country, and engages actively as a citizen in local, state, and national progressive politics. She believes that waste – of anything, including time, energy, effort, or materials – is a form a disrespect to oneself and others, and strives to use organizational systems to better focus both her and her students’ attention on doing this important work together. She also believes that noticing daily details about people’s lives honours us all as human beings, and shows this through getting curious about students and colleagues’ lives to recognize the realities everyone is dealing with as we come to do our work together. It is through these core values that Dr. Pawley tries to embody and advance a more inclusive, engaged, and socially just vision of engineering education. She grew up in south-central Wisconsin, and went to school in England, France, Canada, and the US. Both of her parents were born in England, and her family lives in Wisconsin, British Columbia, Pennsylvania, Iowa, and the U.K. She now lives in Indiana. Her parents and sister are all faculty members at universities, and her brother is a nurse. Her husband also works at Purdue in the School of Engineering Education. Dr. Pawley worked in the Engineering Learning Center and the Wisconsin Engineering Education Laboratory at the University of Wisconsin-Madison for several years, working with teaching assistants teaching engineering learning community courses to first-year engineering students. She helped develop the LINKS program, part of the NSF-funded Foundation Coalition, and started and developed the UW-Madison College Fellows Program, conducted in the late 1990s. With the funding of the Center for the Integration of Research, Teaching and Learning (CIRTL), an NSF-funded Engineering Education Center, Dr. Pawley moved her work to participate in the development of the Delta Program, the UW-Madison manifestation of CIRTL. She contributed to the development of the CIRTL pillars, teaching-as-research, learning community, and learning-through-diversity. She helped design and implement the Expeditions in Learning program, and developed, co-taught, and evaluated the Diversity in the College Classroom course. At Purdue, she was co-PI of Purdue’s ADVANCE program from 2008-2014, focusing on the underrepresentation of women in STEM faculty positions. She runs the Feminist Research in Engineering Education (FREE, formerly RIFE, group), whose diverse projects and group members are described at feministengineering.org. She received a CAREER award in 2010 and a PECASE award in 2012 for her project researching the stories of undergraduate engineering women and men of color and white women. She has received ASEE-ERM’s best paper award for her CAREER research, and the Denice Denton Emerging Leader award from the Anita Borg Institute, both in 2013. She helped found, fund, and grow the PEER Collaborative, a peer mentoring group of early career and recently tenured faculty and research staff primarily evaluated based on their engineering education research productivity. She can be contacted by email at apawley@purdue.edu.